Every play of every game of the 2016 World Series between the Chicago Cubs and Cleveland Indians. The Cubs battle back from a 3-1 Series deficit to claim their first championship since 1908, ending one of the longest world championship droughts in North American professional sports history. The thrilling Game 7, was an 8–7 victory in extra innings. Also includes Game 6 of the NLCS against the Los Angeles Dodgers, a 5-0 Cubs win at Wrigley Field which clinched the pennant. 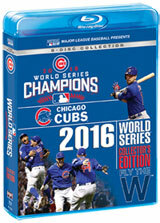 Bonus features include disc of highlights from regular season and postseason games and full-color booklet with box score and notes from each game. 8-disc set.